Something approximating the conversation in this strip happened between Michael Cornacchia (the Cornfather’s inspiration) and I a couple weeks back. He didn’t have a “Naughty List” then, but if he did, I’m sure you wouldn’t want to be on it. I LOVE IT! The look on “Santa’s” face is hilarious… and I love the colors of this strip! Great job Jefbot! Happy Holiday’s too! thanks, funnyshaffer. happy holidays back atcha! Is there any YouTube vids of Michael as Santa? I’d love to see ’em. i’ll ask Michael, but as far as i know there are no videos of him as santa on youtube. i was lucky enough to see santa, live, last friday when he made an appearance at a party i was at. the kids were freaking out with joy. i took a bunch of pictures. i’ll post them to the blog soon. Can you book just the fat pad? That would be worth it for the blank stares on your guests’ faces. Great job, dude! i’ll suggest that to michael the next time he goes out on a santa gig! uhm. i didn’t book the cupcake kid. but he’s here. and he’s dressed like santa. i think i smell bourbon on him. he’s wandering around my apartment looking for the chimney. i’m afraid to move. don’t make any sudden movements, but if you can reach your phone, call 911. CALL 911!!! haha, want a fat pad! redundancy is awesome! ha! wear it with pride, man! ahhh, hahahahhahahah, hahahahhaha!!!! i wanta be on the naughty list too!!!! Lor will be in many future strips for sure, stellak. while not nearly as bad or naughty as xinda (is anyone? ), Lor brings her own flavor of craziness to the family. thanks, alecho! glad you got a laugh out of it!!! First. Jefe, that was harsh, man. Brutal, even. And second, belt goes below the fat pad… every fat kid knows that. heheh. sometimes there’s no way to say, “you really don’t need a fat pad anymore” without being brutal, eleventeen. maybe hallmark will figure that one out. The belt only goes OVER the fat pad if you’re dressing as a pregnant Mrs. Claus. i’m sure Michael can be booked for that character, too, Stan! I can totally picture you and the cornfather having this interaction. if you pictured it a little less funny than the strip, and a little more uncomfortable, you nailed it, seth6! thanks, Michael! glad you have a sense of humor about these things. hahaha! heheh. heh. don’t hurt me. WOW. Maybe I’ll get a car or jewelry…..yummy. Thank you C-Father! don’t sell yourself short, sis. if Michael’s naughty list is true, you’ll be getting a yacht or a house!!! hahaha! heheh. heh. don’t hurt me. I have so done that to a couple of people….HAHAHAHAHAHAHAHA! uh-oh. looks like you’re on the naughty list too, Eptha. Mr. Bot….Stumbled on to your webcomic yesterday. Have now read first to last. Possibly the funniest webcomic I’ve run across in my jaded years; probably because my family bears absolutely no resemblance to yours, but we would recognize each others clans in the wild. heheheh. i believe it’s one mystery that need not be solved, JefbotFan#300. Have a good yin all!! And I thought I was the ssienble one. Thanks for setting me straight. just what i was going for. thanks for noticing, Mr Mojo! Great work you naughty one, you!!!! yo man, just found your comic today, read through the archives, and laughed out loud numerous times.. thanks for that, i WILL be back for updates. i’m happy you found my strip, havvk, and i’m even happier that you laughed while you were going through the archives! thanks for the comment and i’m glad you’re on board – 2009 should be an interesting year for JEFbot. 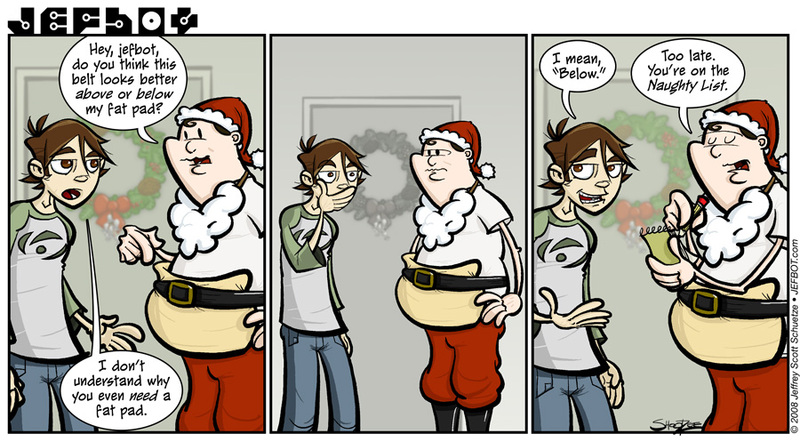 XD Loved the comic Jeff, hope you have a great Christmas! thanks, Nat! hope you had a great Christmas, too!!! That second panel’s his face! Jefbot’s got everyone’s expressions down. Wow, Mike’s Santa picture is perfect. He’s got the rosy cheeks and everything.